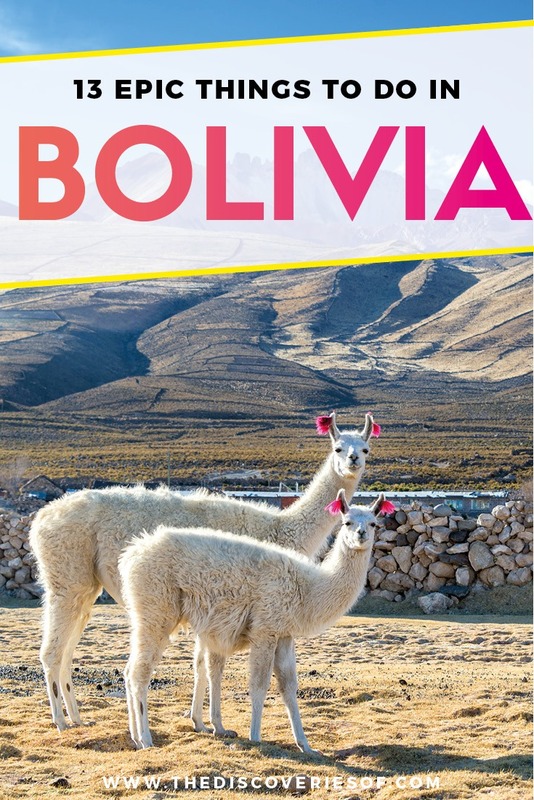 High altitudes, unique ecosystems and ancient civilisations – Welcome to Bolivia. 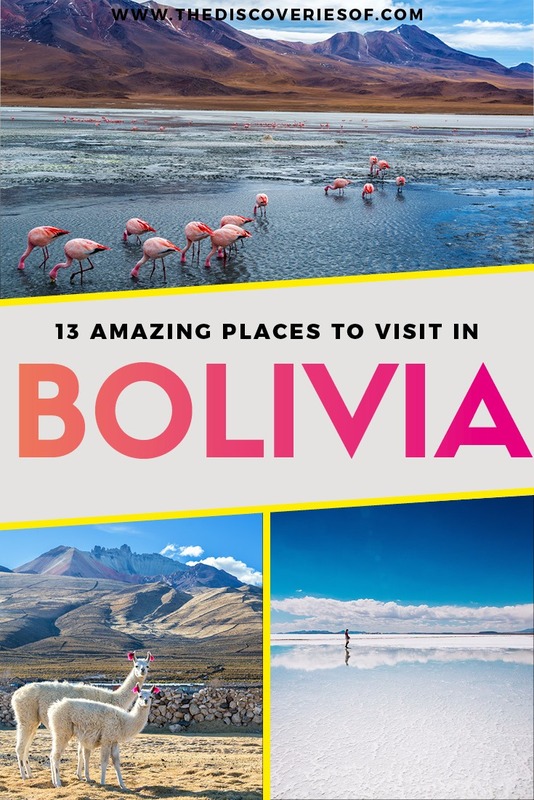 Here are 13 amazing places to visit in Bolivia that you simply cannot miss on your travel itinerary. You have probably seen many a photograph of the Salar de Uyuni in Bolivia. Yet nothing can quite prepare you for the vast expanse of gleaming white that assaults your senses the first time you see it. 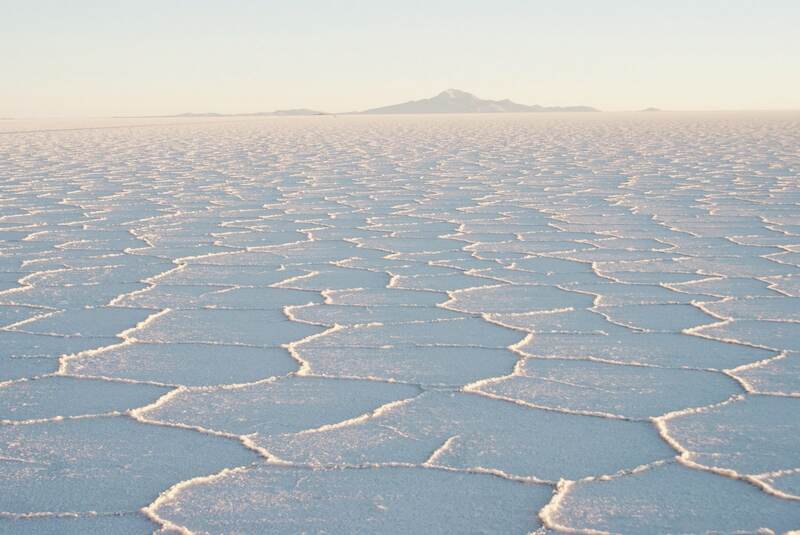 9,000 square kilometres of a thick salt crust – pretty much as far as the eye can see. The salt flats are the largest salt flats in the world and should be at the top of your South America bucket list. If you visit during December to April the flats are covered in a perfectly reflective layer of water (which makes for some pretty awesome Instas). Whatever time of the year you visit, you’re sure to be blown away by one of nature’s most dramatic landscapes. Read more about visiting the Bolivian Salt Flats. Show-stopping sceneries don’t just stop at the salt flats, the nearby coloured lakes are equally impressive. Laguna Colorada’s blood-red tinted waters make for an impressive sight. 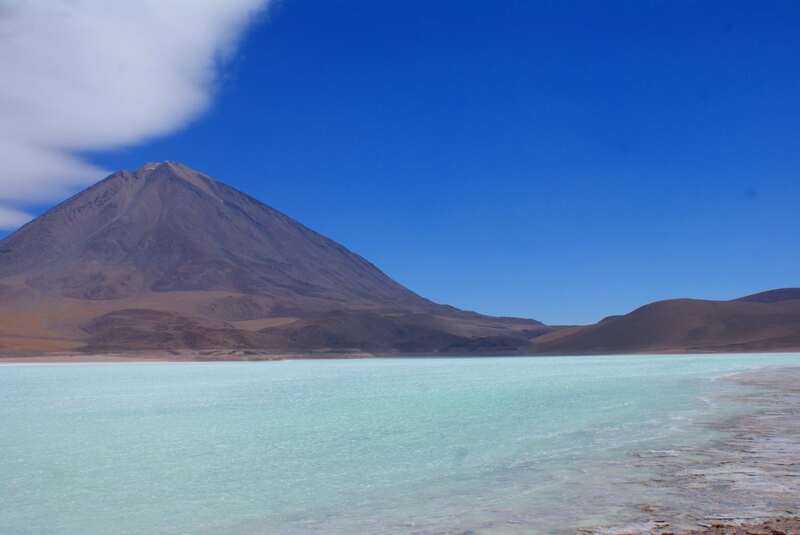 The contrasting waters of the Laguna Verde (green lake) and Laguna Blanca (white lake) derive their colours from the high concentration of minerals contained in the lakes. The Bolivian Altiplano is one of the most remarkable areas in South America – visiting the brightly-coloured lakes should be at the top of your Bolivian bucket list. 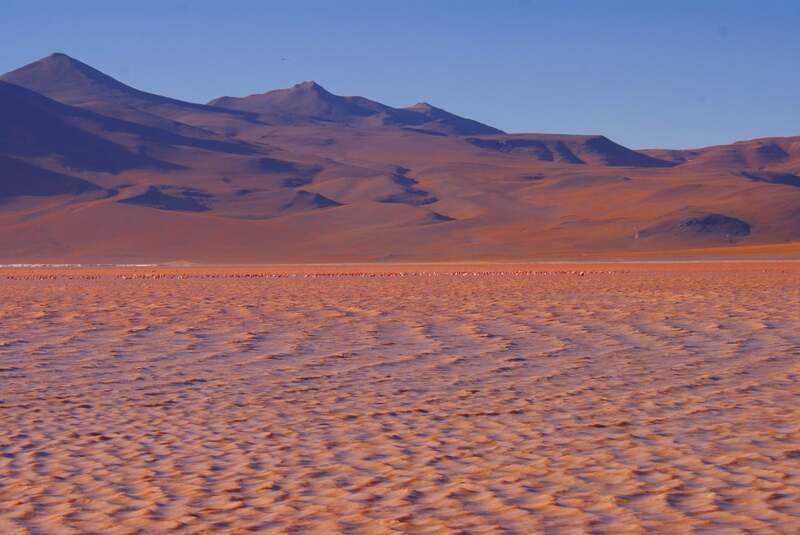 Here are five Bolivian landscapes that will have you booking your ticket straight away. 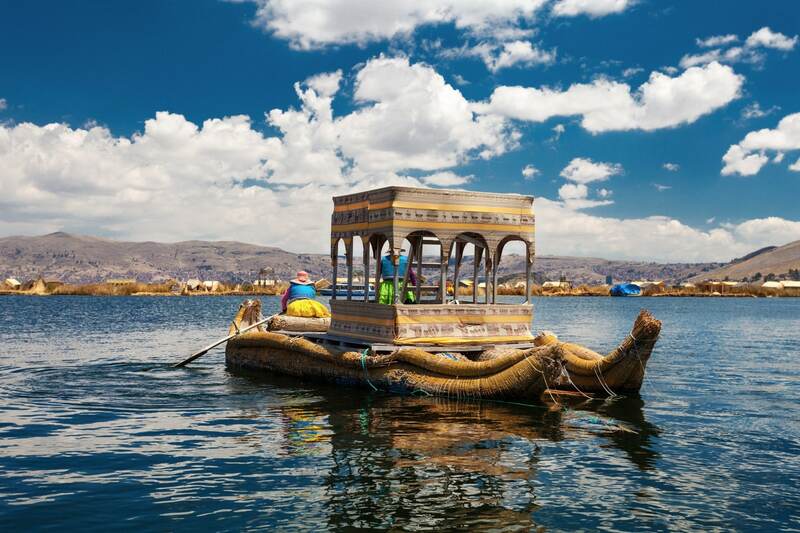 Spanning the border between Peru and Bolivia, Lake Titicaca is more than just a large lake. It’s small traditional villages, challenging mountain treks, small islands and undiscovered nooks. The Incas recognised Titicaca as the birthplace of their nation – something that’s not been lost in the lake’s culture today. While away time in the likeable town of Copacabana, or just hike, kayak and soak up a piece of nature at its finest. Thinking about travelling to South America? You’ll want to check out these step-by-step itineraries to help you plan your trip. First things first. 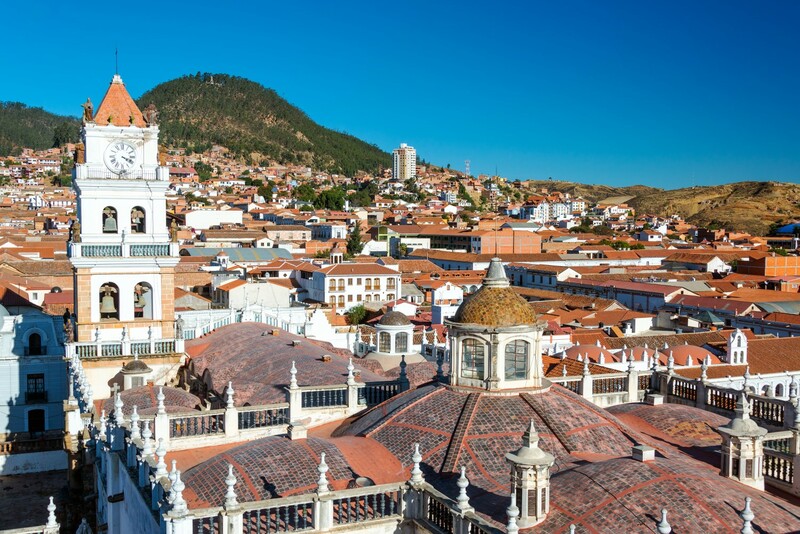 La Paz is not Bolivia’s capital (that’s Sucre – a handy fact that might help you in a pub quiz one day). That doesn’t stop La Paz from capturing visitors hearts with its heady mix of colonial buildings, ancient traditions and high-speed modernity. The city sits 3,500m above sea level, so be prepared to get a bit lightheaded. Take your time, acclimatise and then go and discover this fascinating city. From dried frogs to llama penises, there’s an endlessly fascinating array of goods on sale. There are hikes and adventures to be had in La Paz’s surrounding areas, but when it comes to places to visit in the city itself, you should make a beeline for the Witches Market. 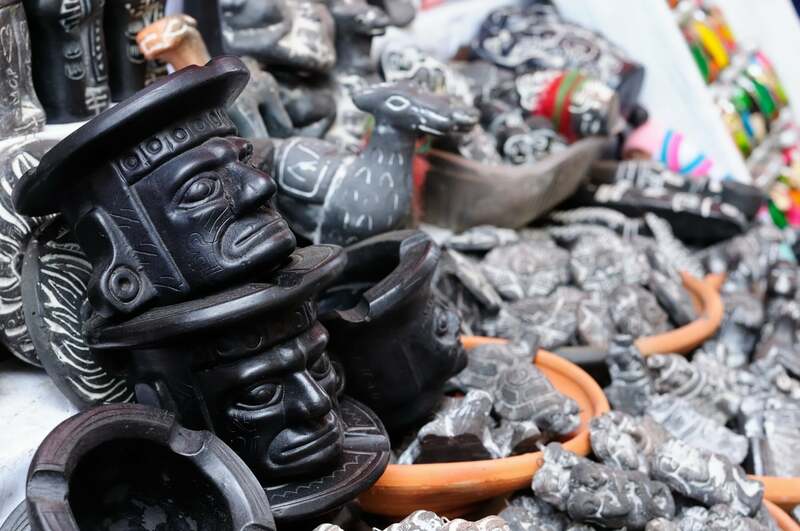 The market sells items integral to the rituals of the city’s indigenous Aymara people. From dried frogs to llama penises, there’s an endlessly fascinating array of goods on sale. The more curious among you may want to hear your fortune from one of the witch doctors who frequent the market’s streets. 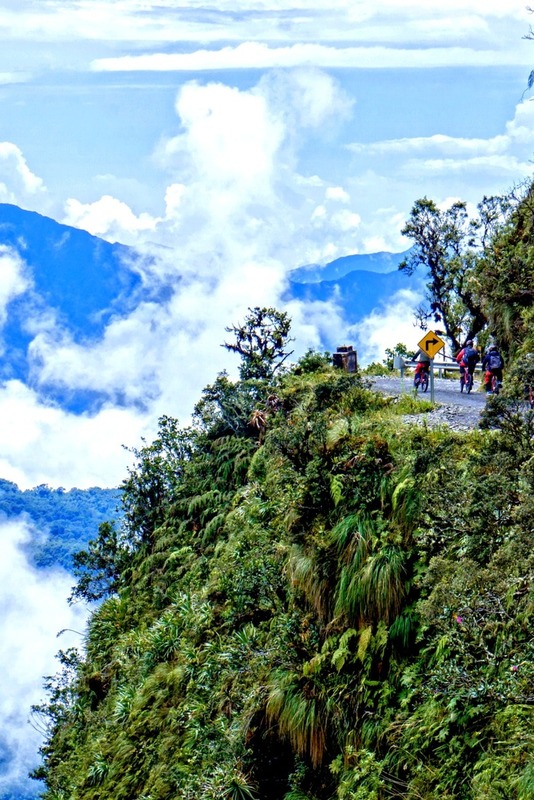 We’ll give you three guesses why the Yungas Road earned its moniker of the “Death Road”. This narrow road winds its way for 69km from La Paz to Coroico along the side of the Cordillera Oriental Mountains. Hairpin bends, terrifying drops and dangerous terrain have all played their parts in creating the most dangerous road in the world. Bikers descend over 1,200 metres from the heady heights of the Highlands down to the humid rainforests below in an adrenalin-pumping excursion and an unforgettable experience. In recent years, the hair-raising mountain bike ride down the road has become one of the must-do things to try when in Bolivia. Bikers descend over 1,200 metres from the heady heights of the Highlands down to the humid rainforests below in an adrenalin-pumping excursion and an unforgettable experience. Here’s why the Death Road is one of our 15 epic adventures you have to try once in a lifetime. Sucre might not have the vast sprawl and cosmopolitan craziness of La Paz, but the Bolivian capital has a charm all of its own. Whitewashed buildings and quiet squares come together to form Bolivia’s prettiest town – it’s no wonder that it was named as a UNESCO Heritage Site in 1991. While it might sound a bit dozy, a thriving university and friendly population make Sucre a great place to stop off during your Bolivian travels. If you’re travelling to Sucre should make Sucre Cathedral their first visit. The cathedral, otherwise known as the Catedral Metropolitana is one of the most elaborate in Bolivia. Set in the heart of the city on Plaza 25 de Mayo, the cathedral’s dramatic interior has enchanted visitors for centuries. Not to be confused with the Valle de La Luna in the Atacama Desert, Bolivia’s Valle de la Luna is a testament to the power of natural forces over time. A series of towering spires and stalagmites made from clay and sandstone carpet the desert floor. The startling array of colours and shapes is guaranteed to elicit a wow or two as you walk around. A series of towering spires and stalagmites made from clay and sandstone carpet the desert floor. The Valle is only about 10km south-west of La Paz so can easily be arranged as a day trip from the city. Make sure you have time to walk around on a few of the trails. Impressive as the valley is from afar, the drastic landscape takes on a new form when you get up close and personal. OK, obviously, for this one, timing is everything. 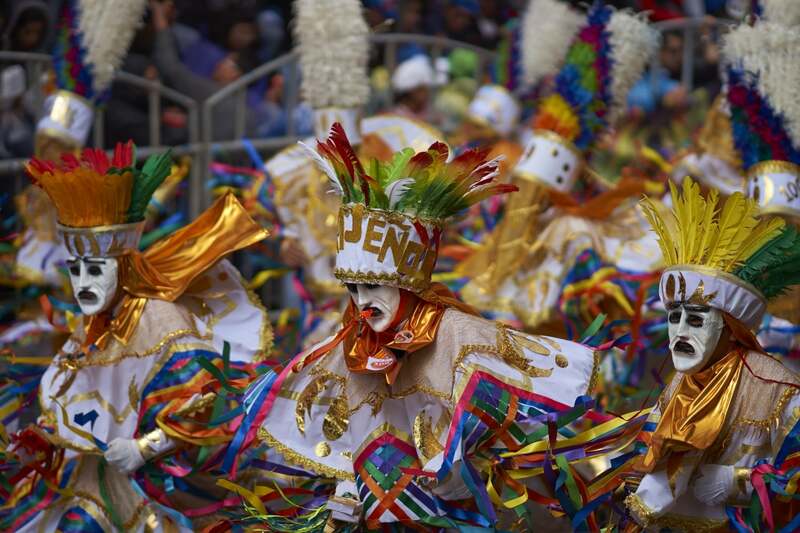 If you are able to get to Oruro for carnival time, it’s hands down one of the best things to do in South America. The carnival starts the Saturday before Ash Wednesday and carries on in a riot of festivity and colour that draws in just under half a million people each year. One of the most spectacular sights is the Dance of the Devils, a procession of hundreds of devils accompanied by a live band and orchestra. Lucifer, Satan and the seven deadly sins feature in this flamboyant show that depicts the triumph of good over evil. Sound like your kind of thing? Put it in the diary now. Even in a country very familiar with altitude, Potosi’s location at 4,000 metres stands out. 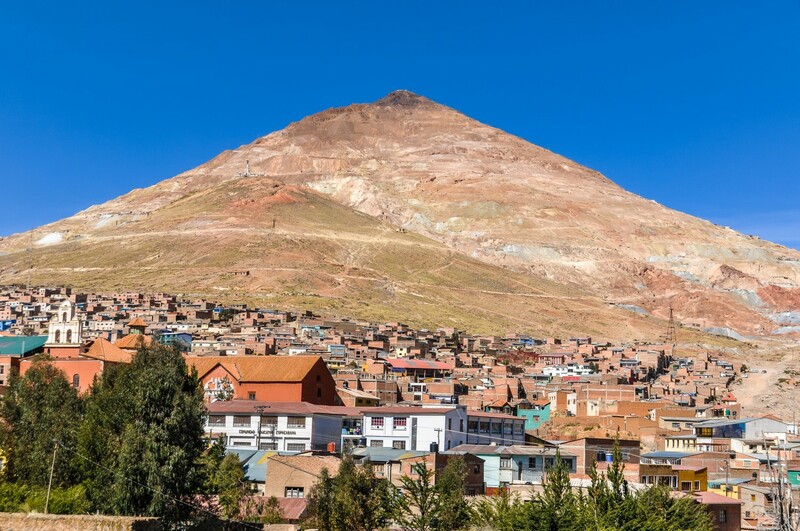 What’s really put the region on the map is the Cerro Potosi, filled with silver, tin and zinc and the heart of Bolivia’s mining industry for centuries. The mountain has spewed out incredible wealth, since it was first mined in 1545, but at a terrible cost. A trip into the mines uncovers the incredibly difficult conditions under which the miners have toiled. The mine is responsible for hundreds of thousands of deaths both from the indigenous community and African slaves forced to work the mines. A visit to the Potosi Mines is a sobering reminder of Bolivia’s past and present. The Valle de la Animas translates as the Valley of the Souls, so called because the Bolivians who named it thought it looked like souls that had been frozen in time. 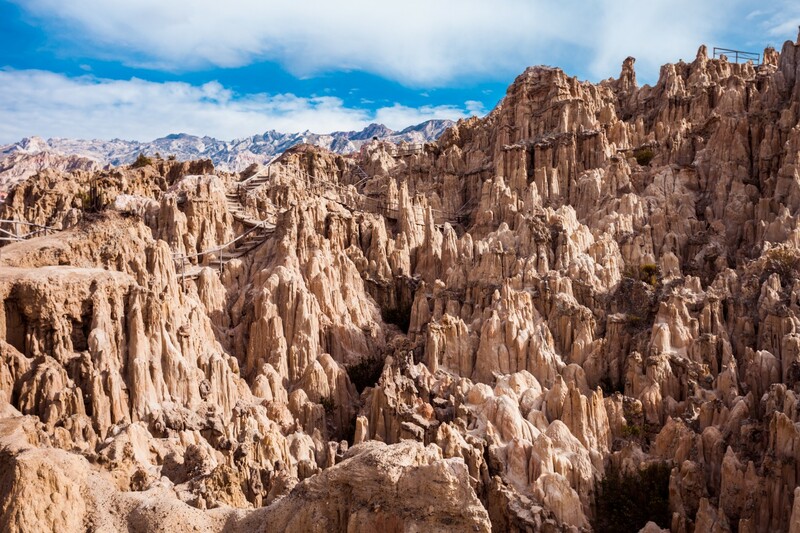 Set against the backdrop of Illimani, Bolivia’s highest mountain, these rock formations are gathered together in a dense mass reaching from the ground in a rugged, other-worldly terrain. Taking a hike through the peaks and gorges, formed through the effects of wind and erosion over millennia is like taking a walk on another planet. Tiwaniku is often overlooked by travellers hurrying through South America, but this ancient site is well worth a visit. 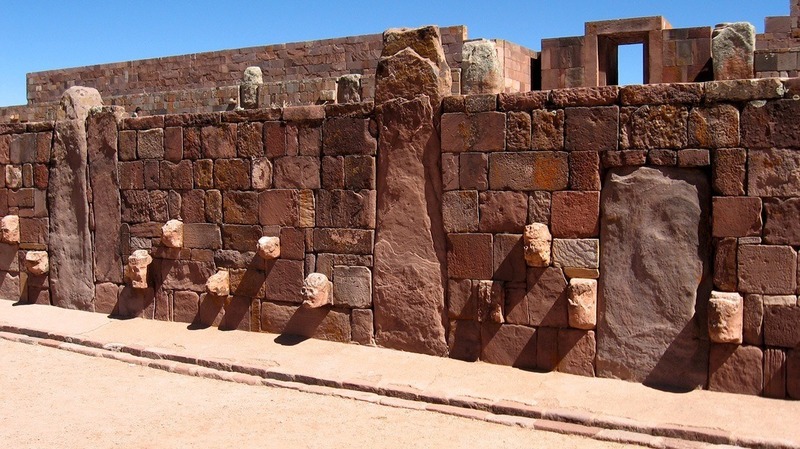 Located to the south of Lake Titicaca, Tiwaniku is now a modern town, but sections of the ancient city, including the ceremonial centre, have survived to date. The city transformed from a small settlement into a large scale city between 400 and 900AD before fading away less than three centuries later. Take some time to walk around the structures, visit the museums and learn what little is known about the civilisation that built the site. 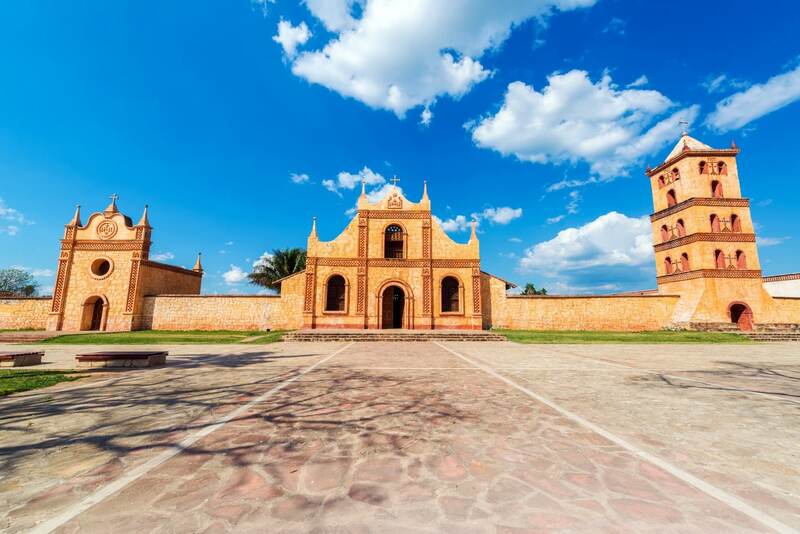 When it comes to historical places to visit in Bolivia, the Jesuit Missions stand out at the top of the list. Travelling through the UNESCO-designated Jesuit Missions of the Chiquitos region is to step back into a time when Jesuit priests held significant sway in the region. Jesuit priests set up a number of small mission towns in the region throughout the 18th century. The result? A unique fusion of indigenous and Catholic cultures that lasted until the Jesuits were expelled by the Spanish crown in 1767. The missions contain some of the most spectacular colonial architecture in Bolivia, a small hamlet of splendour in the midst of the Bolivian wilds. The missions contain some of the most spectacular colonial architecture in Bolivia, a small hamlet of splendour in the midst of the Bolivian wilds. Visiting the seven towns that make up the missions is quite a task but worth it to see the result of decades of restoration work to restore the missions to their former glory. Set aside five or six days to see them all, or make your way to Concéption and San José de Chiquitos, the two most outstanding missions. The jungle paradise of the Parque Nacional Amboro sits at the meeting point between the Andes, Amazon and Chaco. The park’s forest is home to an astonishing number of birds, animals, plants and insects – in fact, it contains over 800 species of birds alone. The park’s varied altitude means that both highland and lowland animal species can be found within it. Mammal wise, it’s home to some of South America’s most elusive animals including spectacled bears and jaguars, along with more common ones like anteaters, tapirs and monkeys. It’s almost impossible to make the trip to Parque Nacional Amboro on your own – we recommend that you arrange a guide in advance. You can do this easily from Buena Vista and Samaipata. Looking for more South America travel inspiration? Check out our series of South America Travel Guides. Inspired by the list? 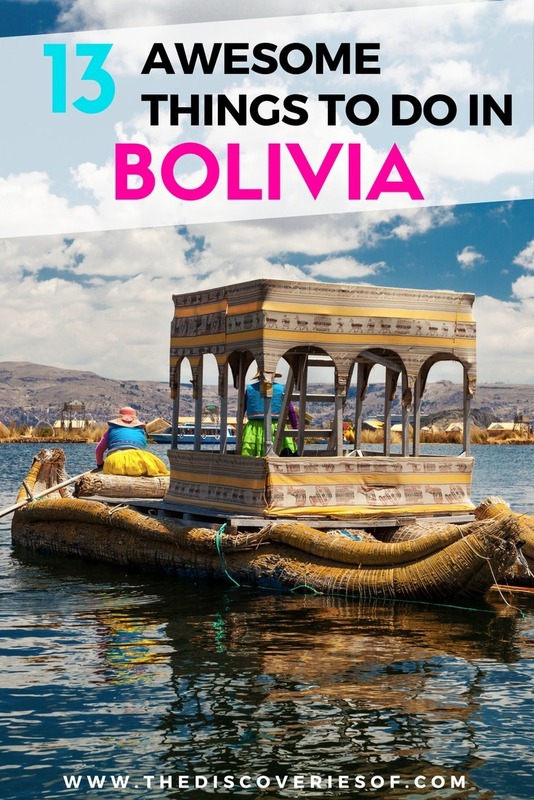 Read this guide to expat life in Bolivia. Like this? Share it on Pinterest (or anywhere else, we love a social share).